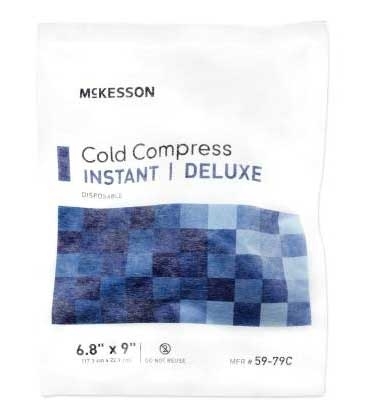 McKesson Deluxe Cold Pack Soft Cloth Disposable Compress 6.8" x 9"
McKesson Deluxe Cold Pack Soft Cloth Disposable Compress from Incontinence Products Plus provide instant and immediate cold therapy. These are disposable cold packs that measure 6.8” x 9” and are covered in a soft cloth that can be applied directly to the skin eliminating the need for a separate cloth wrap. McKesson Deluxe Cold Packs remain cold for approximately 30 minutes after activation. They conform to body contours to help relieve swelling or pain. They are single use and disposable. Economy Moist or Dry Heating Pad Small 12�۝ x 15�۝ Electric Jack Frost Reusable Hot Cold Packs 7-1/2" x 15" Scherer Labs Therapeutic Menthol Gel 16 oz Jar Secure-All Ice Pack with Velcro Strap 6" x 14"